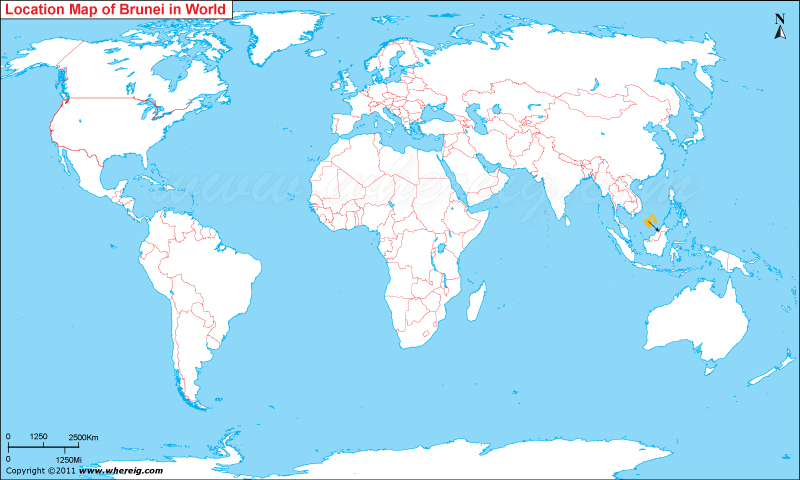 Where is Brunei located on the world map? The given location map of Brunei shows that Brunei is located in the South-east Asia. Brunei map also shows that the country is northern part of Borneo Island which shares its international boundary with Malaysia from all around other than northern side. In the northern side, the small country Brunei makes coastline with South China Sea. Brunei got its independence from the United Kingdom on 1 January 1984. After its independence, Brunei has made its own constitution under which constitutional sultanate is head of the state. However, its legal system is based on English common law. Bandar Seri Begawan is the capital city of the country Brunei� official religion is Islam. About two-thirds people of the total population are Islam. Besides, some other religions that is followed by small group on the territory are Buddhism (about 13 percent and followers are largely Chinese) and Christianity (about 10 percent). Above all, being a Muslim country it follows the Sharia law that prohibits the sale and public consumption of alcohol.